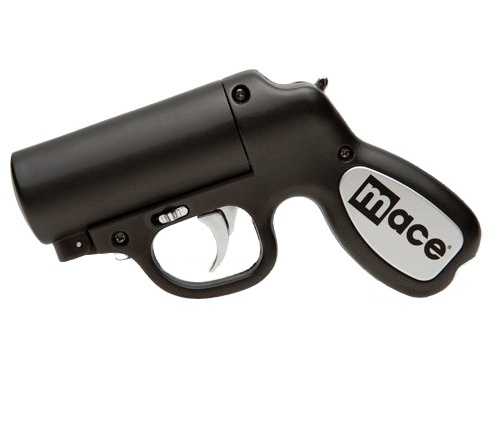 The MACE® Pepper Gun is the most accurate and effective pepper spray weapon available today. The OC super strength pepper spray formula (.74 Capsaicinoids) is contained in a disposable cartridge that fires up to 7 times in rapid succession and can then be quickly reloaded when empty. The weapon is made of rugged metal construction and reloads like a breach loading shotgun. It has a cartridge release on the side and a thumb-operated safety above the handgrip. The cartridge utilizes an advanced delivery system, Bag-In-A-Can™ technology, that allows you to spray a constant stream, reaching up to 25 feet, from any angle including upside down. Other pepper sprays have a range of only 8 to 12 feet. The Pepper Gun shoots a solid stream in a long straight line effective even in a strong wind. The manufacturer states that the trigger activated LED helps you accurately aim the Pepper Gun and momentarily distract the attacker in the dark. However, the LED light has an effective range of only about 6 to 8 feet, so in our opinion it serves as a low-powered flashlight but has no deterrence value. The LED lights when the trigger is pulled whether or not the safety is in the "safe" position. The MACE® Pepper Gun includes One 28 gram OC Pepper cartridge, One Water Test Cartridge for target practice, and Batteries for LED light operation. MACE® Pepper Gun uses an advanced delivery system utilizing patented Bag-in-a-Can™ Technology. This system allows the pepper spray to spray like an aerosol in a continuous fashion from any angle, even when Pepper Gun is held upside down. It sprays 7 blasts up to 25 feet. Pepper Mace® has a powerful Oleoresin Capsicum (OC) pepper formula that creates an intense burning sensation and causes an attacker’s eyes to slam shut upon direct contact. OC pepper is a naturally occurring substance derived from cayenne peppers. Related products are: MACE® Pepper Gun - Silver, Replacement OC Cartridges, Water Test Cartridges, Nylon Service Holster, Leather Service Holster. Pepper Sprays can not be shipped to New York, Massachusetts, Michigan or Wisconsin. They also cannot be shipped to other countries. All orders for these states and outside the U.S.A. will be canceled. FREE SHIPPING - on all orders over $100.00.